CARDIFF, Wales (AP) — Cardiff paid tribute to its missing striker Emiliano Sala in beating Bournemouth 2-0 in the English Premier League on an emotional evening in the Welsh capital on Saturday. Bobby Reid's double — a fifth-minute penalty and a clinical finish within 15 seconds of the second-half kickoff — gave Cardiff only a second win in nine league games on a night which was about a lot more than just soccer. This was Cardiff's first home game since record signing Sala and pilot David Ibbotson went missing after the plane carrying them over the English Channel disappeared on Jan. 21, two days after the Argentine striker completed a move from French club Nantes. Enough money has been raised online to allow Sala's family to fund a private search, after an official rescue operation for the light aircraft was called off with authorities saying there were unlikely to be any survivors. 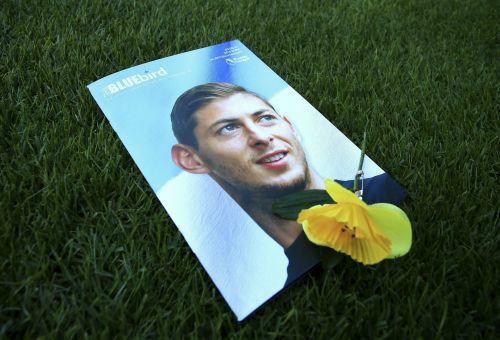 There was a series of tributes before kickoff, with Sala's photograph appearing on the front cover of the matchday program and the two captains, Sol Bamba and Andrew Surman, laying floral tributes on the halfway line. Cardiff's players, who sported daffodils embroidered on their shirts in Sala's honor, celebrated Reid's first goal by racing to the home dugout and holding up a blue shirt bearing Sala's photograph. Cardiff then made a dramatic start to the second period as Reid beat the offside trap to race onto Aron Gunnarsson's pass, and rounded goalkeeper Artur Boruc to roll the ball home for his fourth goal of the season. Cardiff secured a first league win of 2019 to move within two points of 17th-placed Burnley.